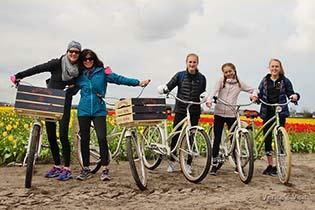 Add an all-sense tickling experience to your visit to the world’s largest spring flower garden, Keukenhof with this bike tour from Leiden to the Keukenhof. Feel the fresh spring wind on your cheeks while you enjoy the sight of the typical Dutch scenery and hear the birds chirp. From the historical city centre of Leiden we follow a canal to the Leiden lake area, where locals enjoy a boat trip. We cycle on through the first quaint flower village, passing a historical castle and before you know it you’ll be in the flower fields. Take in the scent of the hyacinths, get swept away by the colourful tulip fields. This is the moment to take out your camera and take those flower power selfies. 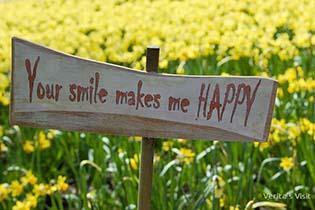 From here till the Keukenhof tulip festival you will be surrounded by millions of daffodils, tulips and hyacinths. 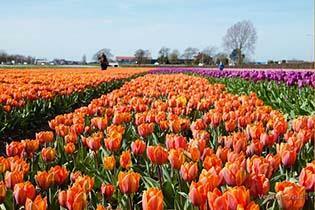 After your visit to Keukenhof we head back to Leiden and make a stop at a tulip picking garden.